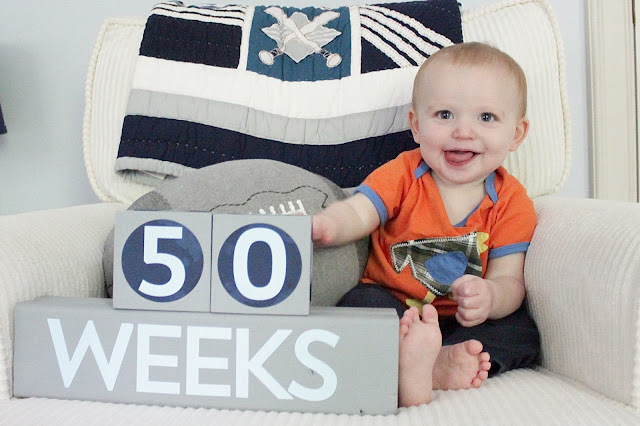 50 weeks!?! Holy moly, how did we get here so quickly?!?! We've had quite a sick week over here...mostly Ella, but Lucas had a little bug too! Blah. Last Thursday, Lucas and I were running errands when I got a call from Ella's preschool, saying she wasn't feeling well. Her allergies had been bothering her for about a week at this point, so that's what I thought it was, but I went to pick her up anyway. The cupcake shop was giving away free cupcakes for their birthday, so we headed there...and guess who instantly felt better?! Ella was back to her normal self after nap, so we went to the Spring Sing program at her preschool that night. She just wanted to read the Bible! Friday, we met up with Cooper and Mackenzie for some fun at the park! I thought everyone was feeling better...until Lucas threw up during dinner. Alllllll over his high chair. So that was lovely. Thankfully, that was really his only issue and he didn't throw up again after that...so we were all clear for cake smash pictures the next day (when he started puking, I was afraid we would have to reschedule his photo shoot)! We met our photographer at a local golf course and I am SOOOO excited to see the professional pics! 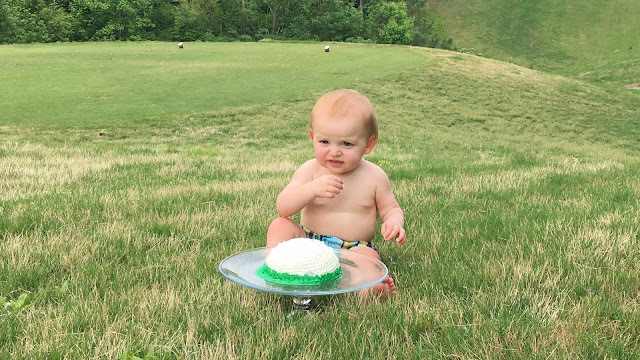 Lulu wasn't exactly sure what to do with his cake; he was more interested in the eating the grass! These 2 were such troopers! It was REALLY hot, and the golf course was really hilly...we were all sweaty messes by the end of it! My friend Chelsea's husband makes farmhouse tables, so he made one for our breakfast area!!! I love it so much! 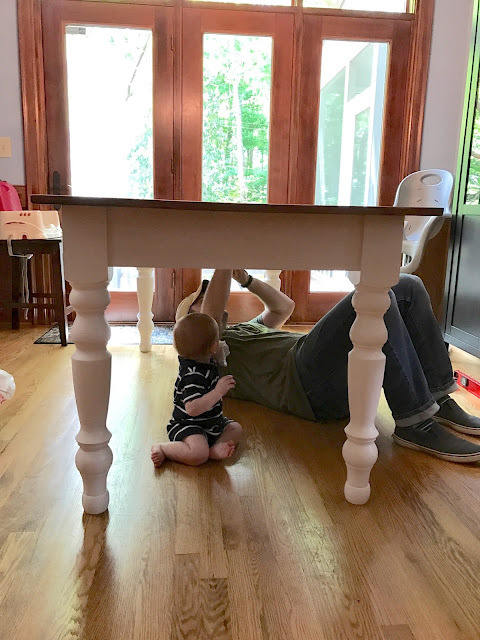 Lucas enjoyed "helping" him put it together! So, after nap on Sunday, Ella woke up screaming that her ear hurt and she also had a fever. Ugh. She was still pretty miserable Monday morning, so off to the pediatrician we went. Of course, as soon as we got to the doctor, her fever was gone. Her ears also looked fine, her throat looked fine...everything was fine. The ped suspected she just had a little virus. Well...of course that afternoon, her fever came back! She wasn't feeling much better the next day, so I kept her home from preschool and let her watch entirely too many shows on the iPad. Yesterday, I thought everyone was feeling better, so we went to story time at our church! Shortly after this picture was taken, Ella decided to throw up in the parking lot. UGHHHH. What the heck. Bless her heart, she took a major nap that afternoon (over 3.5 hours! ), during which Lucas figured out how to take all of the books off of his shelves. Thankfully, Ella hasn't had a fever or puked or complained that her ear hurts in over 24 hours now, so dare I say this mysterious virus has run its course?! I'm not sure if Lucas initially gave it to her or if she picked it up from preschool, but I hope no one else in our house gets sick! We just have too many fun things to do this month to be sick!! !